Wow today is one of the most important days in my Son's life, Cameron is graduating from High School! I'm so so proud of him today! My only small regret that his Dad isn't here to see him graduate! But I know deep down inside of me, Ralph would be one proud Papa! Congratulations Cameron!!! So here is my card, I started off using Early Espresso for my base which is a 5"x 7" finished card size. I then used My Mind's Eye collection called 'The Sweetest Thing' for the rest. The first two layers I used the papers called 'Bluebell -Everyday' and 'Bluebell - Remember' all from My Mind's Eye. I then used 'Honey - Love' for the third layer and for the fourth layer I used 'Honey - Happiness' which I cut out using a Spellbinders die called 'Timeless Rectangle'. 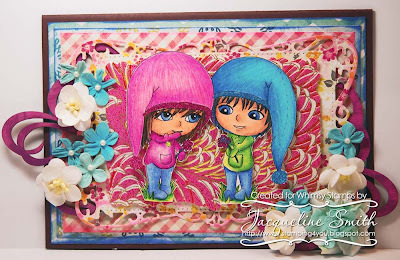 I then cut out another frame using Spellbinders Label 29 and used some Japanese paper from my stash. I then took 2 pieces of chipboard from Fab Scraps and painted them using Tim Holtz Distress Stains using the following colors; Picked Raspberry and Seedless Preserves. I then printed out my image from Scrappers Delight Paper Crafts called 'Baby Boo'. I colored them using Prismacolor pencils and added some glitter highlights on their hats, jacket buttons and flowers. I also added some blue Petaloo flowers to the mix. These images are the cutest! Love your card! YAY Cameron!! Congratulations! I am sure that his Dad was walking right next to him in spirit as he received his diploma! Your card is super Jackie! I love the colors you chose and your coloring is stunning as always!